the Hardwar-Rishikesh bypass in Uttarakhand has tilted by 15 over the past two years. 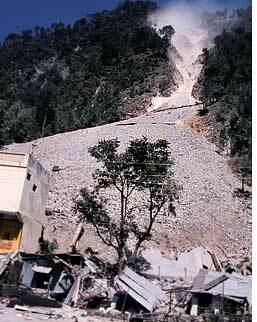 Scientists detected this by installing a system, which they say can predict landslides. In 2004, when the road started tilting gradually, the Central Scientific Instruments Organization (csio), Chandigarh, was given the responsibility to find out if the tilt was a temporary phenomenon and whether it was worthwhile to reconstruct or repair the road. csio took this up as an opportunity to provide for the need of a round-the-clock monitoring system that could predict landslides well in advance. Working with the Central Building Research Institute, Roorkee, and iit Roorkee, the scientists developed a network of instruments that can predict landslides at least 15 days in advance. It has also proved to be much less costly than importing such a system from countries like Japan and Singapore. They installed the system in the bypass and recorded observations 2006 onwards. The monitoring system installed showed that the land is unstable and is increasingly tilting, said the paper published in the May issue of the Journal of Scientific and Industrial Research. Hence, they concluded that it is of little use to repair or reconstruct the road. People now use the main road, which is time consuming. The network consists of sensors connected to a data acquisition system, which processes and interprets the data as it is generated. Subsequently, it is also connected to a computer in a local control station, which receives the processed data and raises an alarm when required. The sensors monitor five parameters--the amount of rainfall, cracks, tilt of rock slopes, inclination of surrounding areas and earth pressure. "Data collected by the sensors are correlated with each other in the data acquisition system and by correlating the data, stress on the ground is calculated. A projection of the stress to be expected is then made. If the projected stress is more than the threshold value at a place, warning signals are generated by the computer at the local control station," said S K Mittal of csio, the lead scientist of the project. He added that some of the sensors for monitoring cracks and earth pressure were imported and the ones to measure tilt and inclination were produced indigenously. csio developed the software for data correlation and interpretation. The sensors, says Mittal, run on solar power, thereby absolving any cost of fuel. Pawan Kapur, director of csio, said that the data acquisition system could record and process data from 12 sensors installed in different locations but in the Hardwar-Rishikesh bypass, five sensors were used because five parameters needed to be monitored there. "If we have to record data in more difficult terrains like Sikkim we will have to use more parameters and hence more sensors," Kapur added. Data from the local network is also being sent to central stations at Delhi, Chandigarh and Dehradun and warnings will be issued from there too. The data will be used after the system is centralized. Kapur also said that monitoring equipment would be put up at different locations, which will continuously send data to a central control room where the predictions will be made by the scientists. The Border Roads Organization will help them identify landslide-prone areas where the systems need to be installed for continuous prediction. The existing system of monitoring landslides in India includes remote sensing techniques or spot monitoring of shifting of land, says R K Mazari of the Wadia Institute of Himalayan Geology, Dehradun. "This is the first system in India that will monitor landslides round the clock by studying various parameters and co-relating the influence of all the parameters. It is still at an experimental stage. With further refinement it can be deployed in landside prone areas," he added. Global Positioning System (gps) is also used to monitor landslides, but not in India, say scientists. The technology, used in Japan and Europe, is capable of monitoring deformations of even less than a centimetre. The main advantage of gps sensors compared to conventional deformation monitoring sensors is that gps neither requires on-the-spot monitoring, nor does it need fibre optic cables for transmission of signals from the sensors as in the new system. However, the attainable accuracy of a gps-based system is limited by the satellite geometry and by systemic errors.